Giving you all the Backyard Landscape Ideas you need to build the backyard of your dreams. Today's backyard's are a whole lot different, from when I was growing up. Who would of ever thought of putting in a outdoor kitchen, landscape lighting, or even a sunroom in the backyard. Backyards are being created to become the "home away from home getaway" or staycation. A place to create outdoor rooms that fit your lifestyle and add useable outdoor living space to your home. No matter what stage of the backyard landscaping process your in, whether you are just starting to gather ideas, ready to do your backyard landscape design, or you need information about trees and shrubs and how to plant them correctly. You are sure to find the ideas and information you need, to turn your backyard landscaping ideas into realities. Ideas on plant colors, textures and shapes to use in your landscape. Resources for do it yourself projects. Places to buy gardening plants, tools and structures online. With over to 200 hundred pages of information on this site, it can be hard to find what you are exactly looking for. First you can go to the site index for articles about design, flower bed ideas, container gardening, water features, Patio ideas, tips and more. If you are wanting plant information go to the landscaping plant index. The plant articles will give you information about that specfic plant along with landscaping ideas, planting and care tips. If you need some ideas for your backyard, you can ask for advise here. 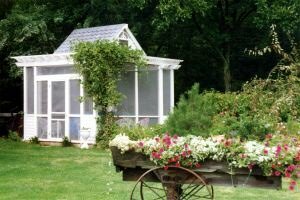 As a landscape contractor, I am constantly searching for unique and new ideas for the backyard. I'll post these ideas in my blog, along with new articles I add to this website. It's easy to subscribe to my blog, just click on the orange button on the right side of the page and add it to your RSS reader. Or you can get my updates by email also. "Plan your landscape for what you like, what makes you happy and what you need." Come back often for this site is like a new landscape, it takes time to grow. I promise to use it only to send you Over the Backyard Fence.